So with the US stock market up almost every day in March, investors are hanging you by your ankles outside a window on a high floor, threatening to let go unless you increase your allocation to equities. How do you escape from this dire predicament? Buy Chinese stocks, where the Shanghai index ($SSEC) has been in a slow sideways grind for the past nine months. The recent move up in copper is hinting that there may be another leg up afoot in the Middle Kingdom. China’s economy is still too strong by half, and has one of the few central banks in the world that is actually tightening. My friend, Dennis Gartman of The Gartman Letter tells me that a nice pennant formation is setting up in Shanghai that is breaking out to the upside. In any case, I always sleep better at night long equities in an economy that is growing at 8%-9%, than one that is poking along at 2%-3%. 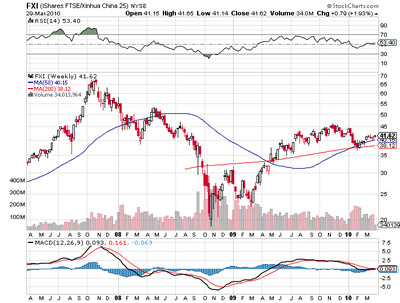 The best way to play this is the China ETF (FXI).